Crestron, the global leader in advanced smart home technology, will debut its newest additions to the DigitalMedia product family at ISE 2019, 5 – 8 February, in Hall-2, Stand C20. The new products include a DM NVX™ encoder and decoder with POE+ support, and DM NVX encoders/decoders with Dante™ audio networking. DigitalMedia is the most complete and advanced platform for managing and distributing digital AV and control signals in the world’s most prestigious homes. The DM-NVX-E30(C) and DM-NVX-D30(C) are encode or decode-only units that support HDMI®connectivity and analog audio. Compatible with all other DM NVX products, they deliver additional flexibility for basic endpoints when only video and audio are needed. The DM-NVX-E30(C) deliver: flawless video with exclusive new Pixel Perfect Processing; support for the highest quality formats (4K60, 4:4:4, HDR); PoE+ support; a fan that can be switched off when not in use (ideal for bedrooms); and use of standard switches and CAT5e cabling. Now supporting 4KZ (4K60 4:4:4 HDR), the new DM-RMC-4KZ-SCALER-C provides an advanced one-box interface solution for a single display as part of a complete DM system. 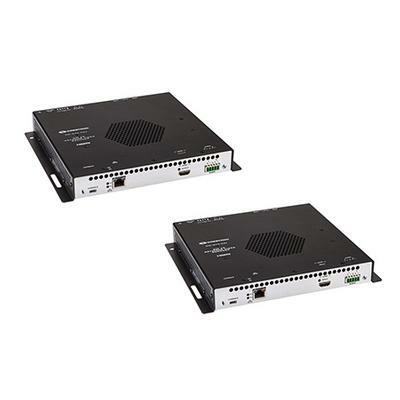 It functions as a DM receiver, 4K/60 video scaler, and control interface, providing a single HDMI output, an analog audio output, plus Ethernet, RS-232, IR, and relay control ports. With a compact, low-profile design it can be installed discreetly behind a display. Visit Crestron at ISE 2019, 5 – 8 February, in Hall-2, Stand C20 for live demonstrations of the latest additions to the DigitalMedia product family.